Yeah, I know Tongue Out Tuesday was yesterday, but how about Washing Wednesday for Wordless Wednesday this Whiskers Wednesday? And Mum has also just found out that it's International Bath Day too! Oh, Athena, you are so lovely bathing. We think every day is International Bath Day. "People often say that motivation doesn't last. Well, neither does bathing - that's why we recommend it daily"
One gest photo for all days! no wonder you are so pristine! International Bath Day! What will they think of next? I had my shower - not a bath today, and Buffy and Chipper got soaked during our walk in the rain. Does that count? Looks like you're taking the holiday (holidays?) very seriously! So that is how you keep yourself looking so beautiful! I like your idea for Washing Wednesday, Athena. Manna and Dexter say that cleanliness is next to catliness. 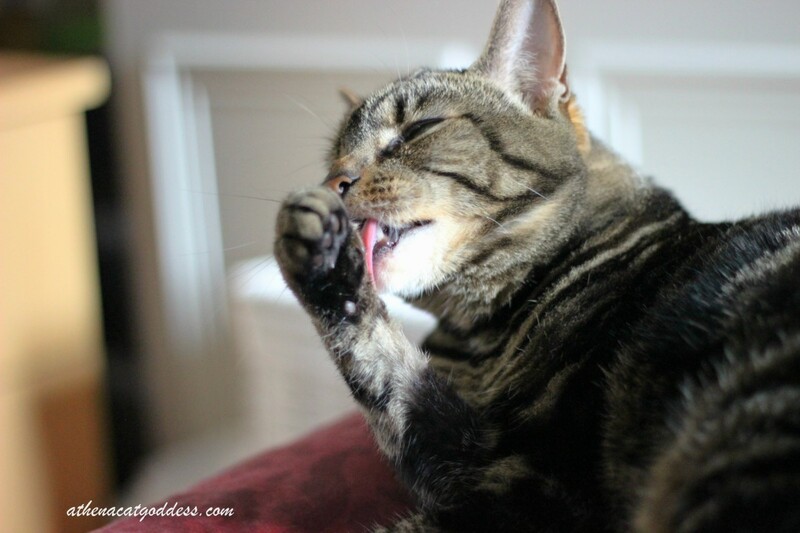 You've got to keep your paws clean! Wow, that is a lot of holidays for one Wednesday. It's a pretty full day, isn't it, Athena? I hope it's Give Yourself a Bath Day, because I'm not terribly fond of the bath mom gives me.